United return to Coplicks this Saturday night buoyed after a dominant performance on the road in Mackay last start. That result was a testament to the faith coach Kristian Rees has in giving talented young local players every chance to test themselves at this level. With several more experienced players unavailable, Harry Saunders, Braedon Steel and Jarran Pfefferkorn were given their chance to impress against the Magpie Crusaders …. and that they did, all putting in very creditable 90 minute shifts. A senior debut too for Jarrah Hall-Hart off the bench, recognition that the close working relationship between Rees and the Youth Men’s coach, John Murphy, is paying dividends. With an arduous 28 game season and an expected long run in the FFA cup a possibility based on current form, Murphy not only has the U20’s primed and focused on their competition but also has an eye on the demands that a rigorous campaign may have on the senior squad and he sets about preparing his charges to be ready to step up to the Men’s squad and take their chance when it becomes available. A third clean sheet on Saturday night from Duro Dragicevic with an assured performance and several first-rate saves to deny the hosts. A Runaway Bay junior, Duro’s international experience as a teenager with the Joeys in the World Cup and time with Sydney FC stand him in good stead for the rigors of the Queensland NPL. A talented shot-stopper and blessed with safe hands, his distribution and ability to pick a telling pass sees him growing into an integral member of an increasingly impressive back five. Not the start to 2019 that the Pride would have expected with the Ipswich based outfit languishing at the foot of the NPL ladder. Some instability brought a change of coach in-season with Terry Kirkham taking the reigns and recruiting to strengthen a squad that saw several notable off-season departures from a side that finished third in 2018 and won the championship in 2017. A mainstay remains in Cameron Crestani, the captain. Former United keeper, Griffin Bambach, is expected to don the gloves for the visitors in what looms as an interesting test for the one time Burleigh Heads goalie. Saturday’s visitors took the points in both outings in 2018, a 3-0 win at Briggs Road in Rd 9 and a 3-1 scoreline at Station Reserve in Rd 22. Brandon Reeves scored United’s solitary goal against the Pride in 2018. 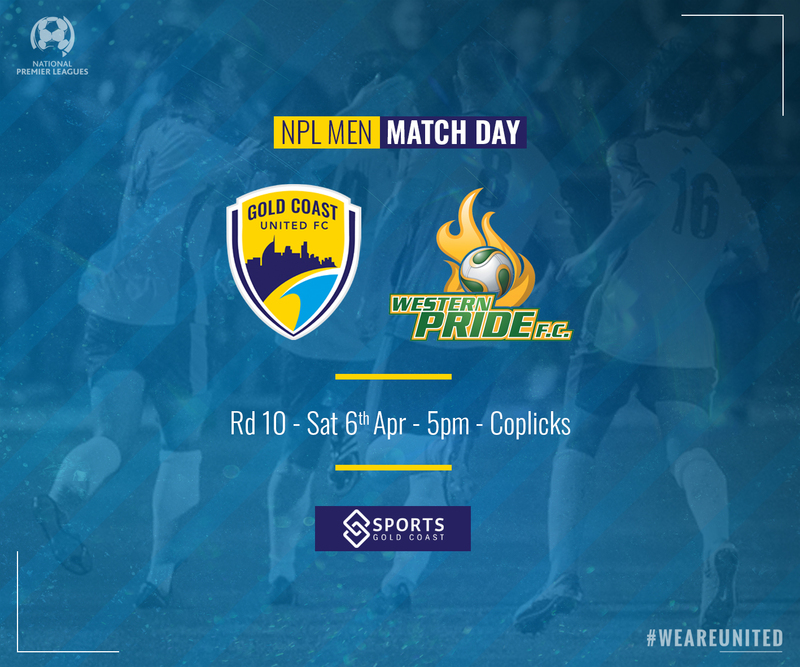 Can’t make it to Tallebudgera, the match will be live streamed on Football Queensland’s youtube channel.